Julio Cesar Chavez Jr. was not in condition to fight. 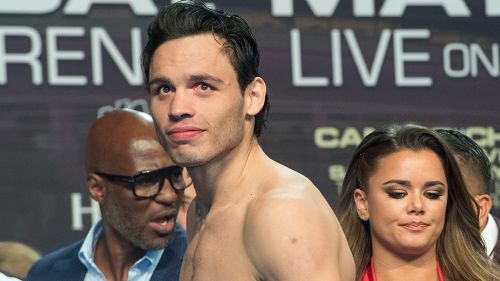 That's according to his father, legendary Mexican world champion Julio Cesar Chavez Sr.
Chavez Jr. was set to fight Alfredo Angulo on the undercard of Deontay Wilder vs. Tyson Fury event at Staples Center in Los Angeles, but pulled out this week. Guadalupe Valencia, who serves as Jr's legal adviser, explained on ESPN Deportes what led to the decision. "Last week he went with the ophthalmologist to get the exams, after that the dad and Julio talked and [Chavez Sr.] thought that he was not 100 percent for the fight. A week ago it was decided that if he was not going to be 100%, after so much time without having a fight, it's better not to fight," Valencia said. "The reality is that Julio looks good, but the father did not like that he did not have enough boxing training in the camp, he wants to see him with more boxing ... Imagine, if he came back against Angulo and he did not look good, he would be in an even worse position in his career. The whole team decided to postpone his return to January or February, we all have seen a lot of progress in him, but the father knows the most about boxing, he told the team, and this decision was made." Chavez wrote on his Instagram: "I want to thank all my fans for so many years of support, my team and I have decided to postpone my comeback, even though I've been training very hard, I have not managed to get where I want to be, I hope to be back as soon as possible, but first there is my health and my family, may God bless you," Chavez Jr. wrote in his social networks. Chavez (50-3-1, 32 KO's), 32, who held the WBC middleweight world title from 2011 to 2012 before getting outpointed by Sergio Martinez, has not fought since May 2017 when he was blown out by unified middleweight world titleholder Canelo Alvarez in a unanimous decision.